"The Day Tom Strong Renegotiated the Friendly Skies" - airplanes across the world can no longer fly. 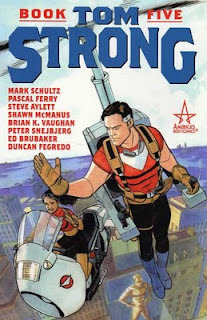 Tom Strong investigates and discovers a secret his father uncovered 100 years ago which allowed man to achieve flight! "A Fire in His Belly" - the origin and motivations of Pneuman are explored as we witness Susan Strong's final dying request of Pneuman - to ensure Tom never suffers! How far will Pneuman go to keep his word when his artificial morals are far different than our own? Features a battle with villainess, the Eye-Opener! "The Terrible True Life of Tom Strong - Part 1" - Tom, Tesla, and Solomon track down a former sidekick of Paul Saveen's turned major science criminal - Eldon Morovia. He is trying to hijack reality with an ancient Mayan jewel/helmet artifact. Tom and crew seemingly stop the scoundrel, but then Tom wakes to his real life - mundane factory worker! "The Terrible True Life of Tom Strong - Part 2" - Tom's therapist attempts to cure him of the bizarre dreams of being a science-hero and return him to the working world. The delusions get stronger when an accident happens at the factory where Tom works. Is he completely crazy or is there a larger conspiracy under the drab surface of his life? Mike Tells It Straight: Moore and Sprouse are wholly absent from this volume (Sprouse still contributes covers) with a bevy of well-known writers/artists filling in. This volume was my least favorite so far, although the last three tales (including anchor story True Life) are decent. The price remains at $24.99 and $17.99 despite the low page count (which always rubs me the wrong way). Let's hope Moore and Sprouse return soon!